Thailand’s draconian Internal Security Act was passed in 2007 in its 11th hour by a national legislature appointed by a military coup. Its targets appeared to be the ongoing insurgency in Thailand’s five Muslim provinces in the Deep South, collectively called Patani. However, ISA has lived on to manipulate public opinion by creating a climate of fear in ordinary Thais by being invoked against public demonstrations. ISA has been used against largely nonviolent rallies seven times since July 2009. The largest of these, with more than half a million demonstrators, many from the rural Northeast provinces called Isaan, started in March. The Redshirts (not be be confused with other Reds) began after Thailand’s prime minister, billionaire businessman Thaksin Shinawatra was deposed and exiled by military coup d’etat on September 19, 2006. His populist policies such as free universal health care and education through high school covered up huge corruption on his watch but made him an icon of the rural people. The original Red movement focussed on getting him back. It is highly unlikely to think this will happen. Early this year Thailand’s Supreme Court confiscated the ill-gotten billions he made while he was prime minister. Since Thaksin’s ignominious self-exile rather than face criminal charges, the billionaire fugitive has picked up at least several foreign passports and has been waging an information war from abroad against Thai government and paying for at least a portion of the Reds’ operating expences. His words to his followers have been continuously blocked by Thai government on satellite television, videolinks, websites and social networking. Thaksin’s views were widely held by government to be anti-monarchy and Republican and his goals suspect. The government propaganda machine has geared to great lengths to instill fear through all levels of public media. Whatever government says to the contrary, normal life in Bangkok and the Thai economy have been hardly affected, let alone ground to a halt. However, the Reds are growing in number and the new, urban faces don’t care much for Thaksin. The present-day Red movement’s stated aims are to remove the appointed coalition government composed of the old elite, called ammart, and hold free elections immediately. Of course, billionaire Thaksin was hardly less than elite himself but he was overwhelmingly elected by popular vote. For better or worse, whenever elections are held, it is likely former Thaksin cronies will sweep overwhelmingly into power. To reach the goal of free elections, another goal of the Reds is to dissolve the present appointed ammart Parliament. The military coup government rescinded the widely-respected pre-Thaksin 1997 Constitution, called the People’s Charter and protecting human rights and civil liberties, in order to protect themselves from prosecution. The military appointed a drafting committee which resulted in the latest 2007 Constitution which was narrowly approved by general referendum. Most of the public’s “Yes” votes were thought cast simply to call a stop to the endless discussion. So the third goal of the Reds is to revoke the present military Constitution and return to the 1997 charter but with amendments subject to public referendum. There is concern that some of the Reds’ amendments may pave the way for Thaksin’s return to power. 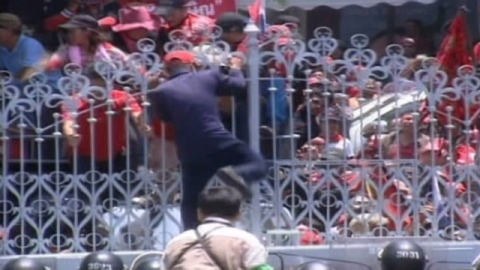 With this backdrop of the Reds’ fluid rallies, there have been more than 11 bomb attacks in Bangkok, mostly using military-issue M79 hand grenades. Bombings have occurred at the Supreme Court, the Elections Commission, the homes of the Royal Privy councillor, Prem Tinsulanonda, and the prime minister, Abhisit Vejjajiva, the Ministry of Health, the Customs Department, a Highways Department depot, the Bangkok Bank headquarters and branches and the Thanachart Bank—we’re certain we missed some! In addition, there have been some Molotov cocktail attacks but it is also uncertain these were heaved by the Reds rather than a ‘fourth hand’ with a government agenda. Just prior to the Emergency Decree, two Bangkok television stations, one military and one government, were bombed, injuring 11. None of these show definitive proof of Reds’ involvement and may well have been used by a “fourth hand” acting to justify further government repression. Thailand employs 700 of the British GT200 bomb detectors recently discredited as useless. But, of course, they can also detect ‘drugs’! On March 23, Thailand’s government again invoked the provisions of the Internal Security Act giving government widely repressive powers to counter the Reds’ huge street demonstrations. On April 7, after weeks of protest, government used the powers of Emergency Decree to declare martial law. 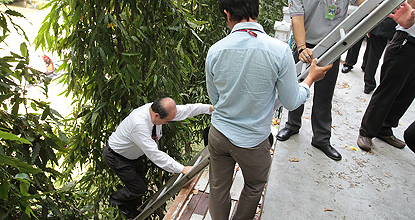 Reds found Thai government unresponsive to their demands, so they peacefully stormed Parliament forcing many humiliated lawmakers to leave by climbing ladders over the back wall to be evacuated by helicopter. Although the Reds captured weapons from Parliament’s police and military security, they publicly returned all weapons to police. Reds finally struck at the heart of Bangkok, not Parliament but the downtown shopping district, forcing major department stores and shopping complexes to close giving new meaning to ‘exclusive’. 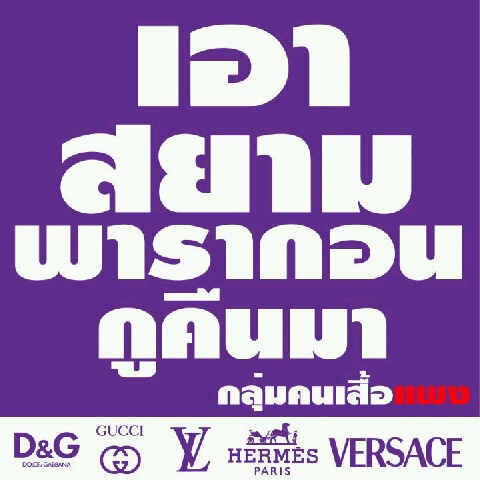 Poster reads, “Give me back my Siam Paragon!”, signed by the “expensive shirts group” . However, once Reds vacated the station, government once again pulled the station from the airwaves by Saturday morning. Government is certainly not trying to win Red trust by treachery and broken promises. As at Parliament, weapons and equipment captured from police and troops were later returned and accounted for. April 9, third day of martial law, the Deputy PM’s CRES center authorised the ICT ministry to block further websites and Twitter if they were being ‘provocative’ in inciting disunity. (It has been our observation that government is easily provoked!) He stated that a further 9-10,000 websites (press reports vary) had been blocked since the start of Red rallies in March and that a list of 700 more will follow. Obviously this list had been prepared long beforehand to take advantage of the fact court orders were not necessary. So far, Freedom Against Censorship Thailand (FACT) has not been blocked, as we were during the Red demonstrations in April 2009. However, these new government figures bring the total number of websites blocked in Thailand near to 65,000. Citizen journalists write the only real news available, as it happens. But bloggers can bearly keep up with Thailand’s fast-paced game. Thailand’s situation has often been compared to Nepal, where the Royals were slaughtered and the monarchy deposed by Maoists. So far, we are not Kyrgyzstan and there is no body count. Let’s hope it holds until Thai government retires gracefully. Saturday Midnight Update—Troops moved in just after dark to clear the shopping belt and streets near Parliament, mostly using rubber bullets and teargas. However, at this moment there are 11 confirmed dead Reds—including a Japanese Reuters photographer on assignment—so there were at least some live rounds fired. Scores if not hundreds wounded.